Solo Cold Paper s SCCR53J8000 $6.69 Cold cup features a wet wax coating that's perfect for heavier cold applications such as thick milkshakes or smoothies. Smooth rolled rim adds strength to the cup and ensures a leak resistant lid fit. 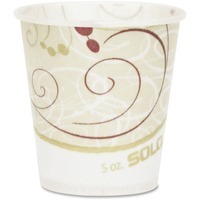 Paper cup offers superior rigidity that's perfect for extended use.